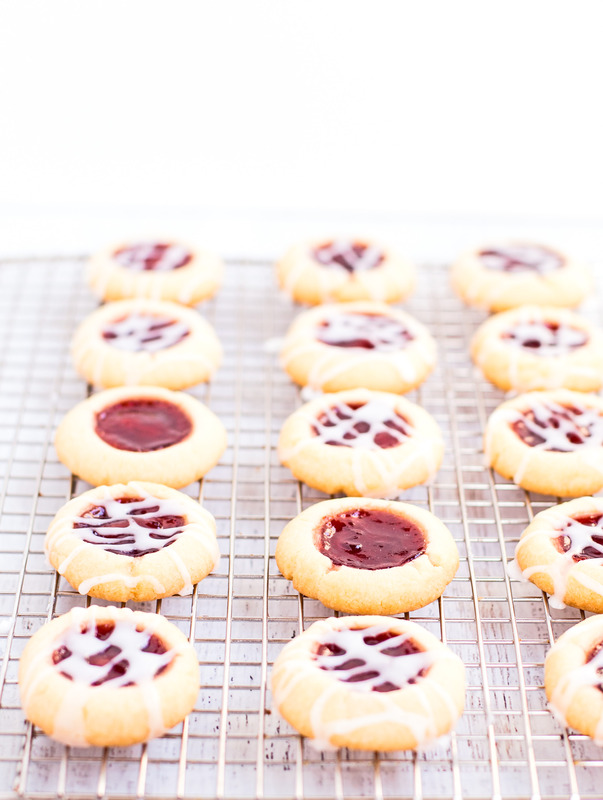 Christmas is less than a week away and despite the fact that I’m hosting the big day I still just can’t stop focusing on Christmas cookies, particularly, these Raspberry Almond Thumbprints. 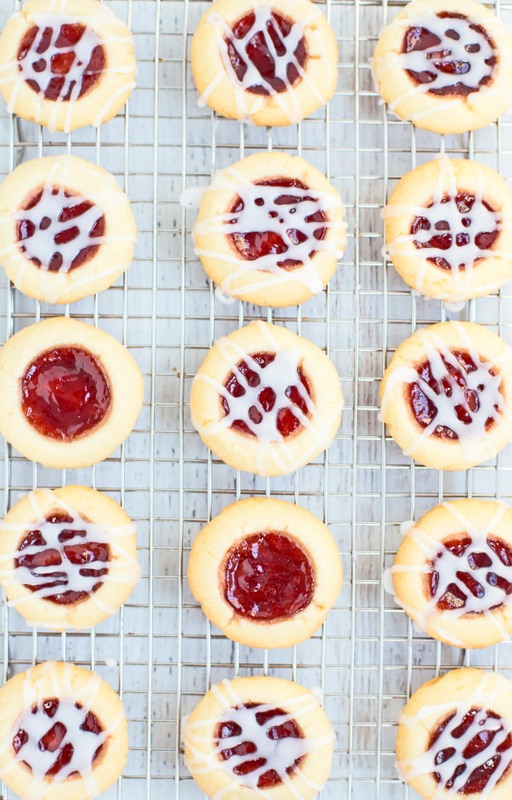 These cookies are festive, perfectly bite-sized and delicious. They almost cleanse your palate in a sea of chocolate and peanut butter themed desserts. They’re definitely in my top five and make it onto my annual Christmas cookie tray every year. Have I mentioned that I spend every December 23rd making ALL of my Christmas cookies? And by all, I mean ALL: Chewy Gingerbread Cookies, Chocolate Dipped Shortbread, Chex Mix Clusters, Magic Squares, Egg Biscuits. PHEW! It is a full-on day of marathon baking to the max. I love it and hate it at the same. But in all seriousness more love because in the end I have so many tasty treats to eat while I wrap presents into the wee hours. But back to these Raspberry Almond Thumbprints… there are few things I’ve learned over the years that allow me to end up with near perfect looking little gems that aren’t all sloppy and runny (believe me, I’ve had my fair share of those). 1) I use a mini ice cream scooper to get dough balls that are all exactly the same size. 2) I use the back of a 1/2 tsp measuring spoon to make the round indent to place the raspberry jam. I have the All Clad measuring spoons that have a straight edge into the round bottom, which really helps get a nice edge. 3) I place the jam into a small squeeze bottle like these and place the bottle in a measuring cup of hot water to loosen up the jam and make it come out of the bottle more smoothly when filling the cookie dough. 4) If you’re going to opt for the glaze on top, use one of those small squeeze bottles for that as well. I love this time of year – all of the craziness, rushing, panicking and then finally just enjoying and getting to relax and spend time with family and friends. I hope you all enjoy the holidays with your friends and family and if you have time, make these delicious beauties. In a medium bowl, sift together the flour and salt Set aside. With an electric mixer fitted with a paddle attachment blend together the butter and sugar on medium-high speed until it's light and fluffy. Scrape down the sides and add in the almond extract and mix until well combined. Slowly add in the flour with the mixer on low, then raise the speed to medium-high. Mixture will be crumbly at first but it will come together - be patient! Once the dough has formed, use a small ice cream scooper (or a tablespoon) to scoop 1 tbsp of dough and roll into balls. Line the dough balls up on parchment lined baking sheets 2 inches apart. Use the back of a 1/2 tsp measuring spoon (or your thumb) to make an indentation into the center of the cookie dough balls. 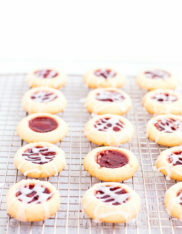 Place about 1/2 tsp of raspberry jam into the indentation either with a small squeeze bottle or carefully with a spoon. Chill the cookie dough for 15-20 minutes and then bake for 12-14 minutes or until the edges are slightly golden. Allow the the cookies to cool on the baking sheet for 5 minutes and then transfer to a rack to cool completely. Once the cookie have completely cooled, whisk together the glaze ingredients and drizzle the cookies with the glaze.